Yeah, as of today I’ve been at this blogging thing for ten years. An entire decade. I’m still going! 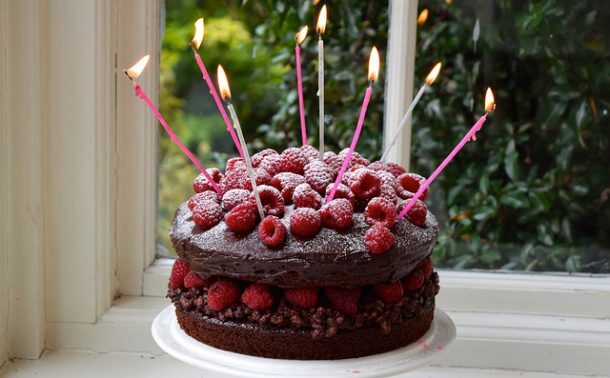 I always find my birthday post a bit difficult to write as I don’t actually know what to say, so instead I’m going to talk about cake. 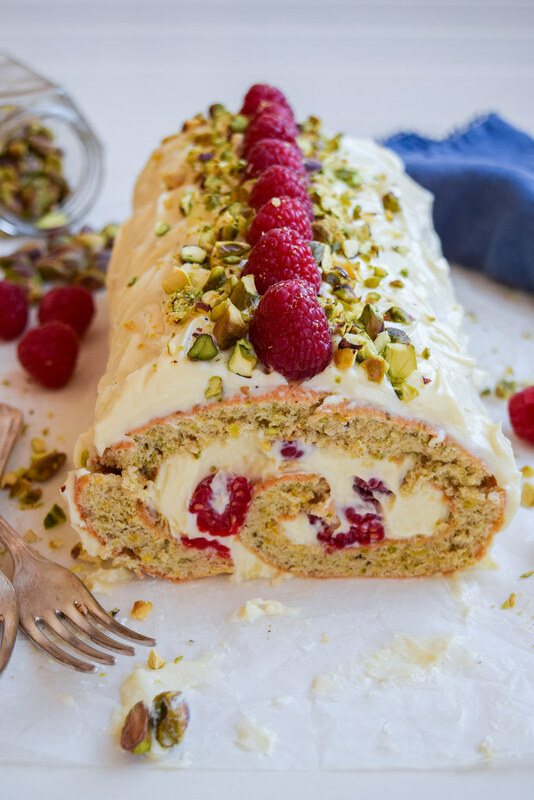 More specifically, this Raspberry, Pistachio & White Chocolate Roulade from the latest Ottolenghi book Sweet which – since making it as one of the desserts last Easter lunch – has become my go-to entertaining dessert; it is actually way easier to make than it looks! And you know how I’m not really a sweets person. 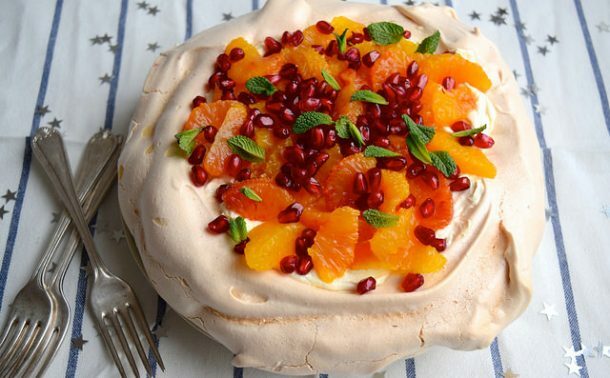 There are two things I love about this cake / roulade. The first is that it is very forgiving; if it cracks a little when you roll it you’re covering the outside in white chocolate cream cheese anyway. And if it cracks a little when you cut it, like you can see in these pictures, it does not matter as it is already on the table for you to serve up – FYI, this is less likely to happen if you let the cream set in the fridge for a bit before serving, I just did not get a chance to do this as there is barely enough room for the roulade in my tiny fridge after a few slices had been taken off! The second thing I love about this cake is that is is sparing with pricy ingredients, only using 70g of ground pistachios. If you keep in mind that shelled, unsalted pistachios are £28.06 per kilo in Waitrose, and that 300g of them went into the truly awful Pistachio & Seville Orange Cake in this month’s Waitrose Food magazine (soggy, way too bitter and with a really odd texture) you can see why I’m a bit hyper aware of this at the moment. 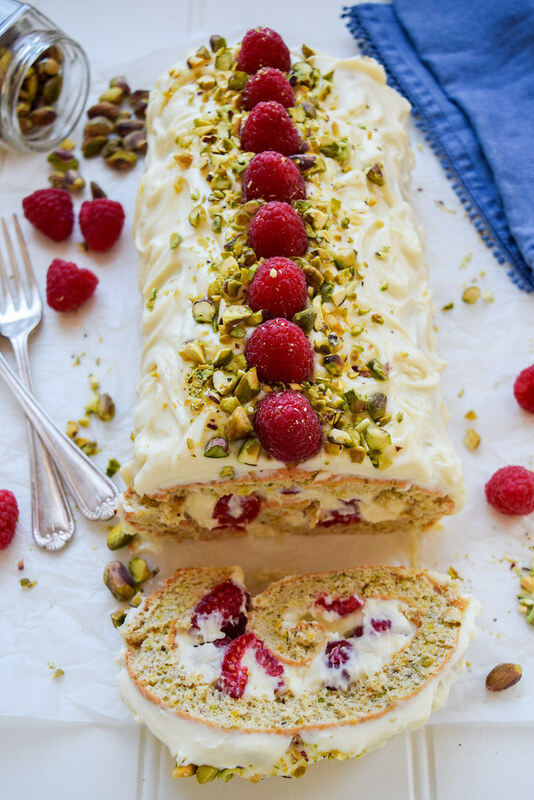 And if you’re already shelling out for fresh raspberries and two bars of white chocolate, a load of pistachios when you only need a few for a beautifully light, nutty sponge would just be adding insult to injury. 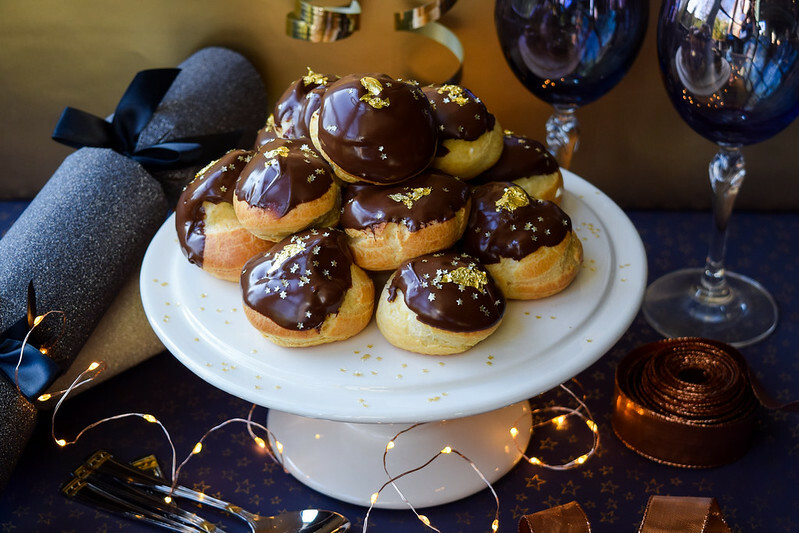 So yeah, here is a little something to serve up at your next celebration, in honour of my little celebration today. I initially did not have any plans, but then I figured that ten years of blogging – 10 years of sticking to anything solidly is kind of a big achievement, so I’m going to be spending the day in Kent with my parents, the two people I think have given the most time and support to my little website over the years with a celebratory lunch at my all time favourite gastropub. Thanks all of you for sticking with me, reading my blog, cooking my recipes, and buying my book since 2009! I really, really do appreciate the love and support you all send by way! 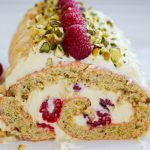 I’ve only made really minor changes to this Raspberry, Pistachio & White Chocolate Roulade from Yotam Ottolenghi and Helen Goh’s book Sweet to make it easier to follow for less experienced bakers, and to make it better suited to small kitchens. First, make the sponge. Pre-heat the oven to 180 degrees (355 fahrenheit). Lightly grease a roulade tin (I use this one) with a little of the butter, and line with baking parchment. Pulverise the pistachios until they’re fine, but not quite starting to give out oil. Set aside. Put the egg yolks and the sugar in a large mixing bowl, and using an electric whisk beat until the mixture is thick, pale and has doubled in size – this should take about four minutes. Fold in the pistachios. Fit the balloon attachment to your stand mixer, and whisk the egg whites until the form soft peaks. Fold the egg whites, 1/3 at a time into the pistachio mixture. Fold in the flour and the salt. Pour the mixture into the prepared tin and bake for 15 minutes until slightly golden, and the sponge springs back in the middle when gently touched. Allow to cool in the tin for 5 minutes. Sieve 1/2 tbsp of the icing sugar evenly over the sponge. 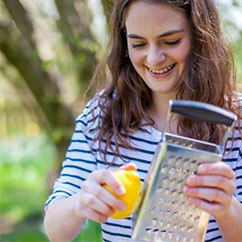 Lay a clean tea towel over the top, then a wire cooking wrack, top down. Flip the roulade so you can gently pull off the baking parchment and sieve over the remaining icing sugar. With one of the short ends of the sponge facing you, gently roll the sponge as rightly as you can into a roll, with the tea towel instead. This is called training the sponge. Allow to cool, rolled up for 10 minutes. This will help you create the perfect roll when the time comes to fill your roulade. Gently unroll, then leave to cool while you make the white chocolate cream cheese. Melt the white chocolate in a heatproof glass bowl set over a pan of simmering water, making sure the bottom of the bowl does not touch the water; the steam will melt the chocolate. Wash out your stand mixer and fit the paddle attachment. Beat together the butter and cream cheese until smooth. Beat in the chocolate, then add the cream and the almond extract (if using) until you just have the texture of a spreadable cream. Once the sponge is totally cool, it is time to assemble the roulade. Spread 2/3 of the cream evenly over the sponge, leaving 2cm clear at the end furthest away from you. Evenly sprinkle over most of the raspberries, setting aside a couple of handfuls of the best ones to decorate the top. Stay calm, and be confident. Starting at the end closest to you, roll up the roulade, turning it over slightly at the end to seal the end under the weight of the roulade. Use a large spatula to transfer the roulade onto a long board or serving dish. Using a palette knife smooth the rest of the white chocolate cream over the top of the roulade, stopping just short of where the sponge meets the plate, using a slight swirling motion if you can manage it. 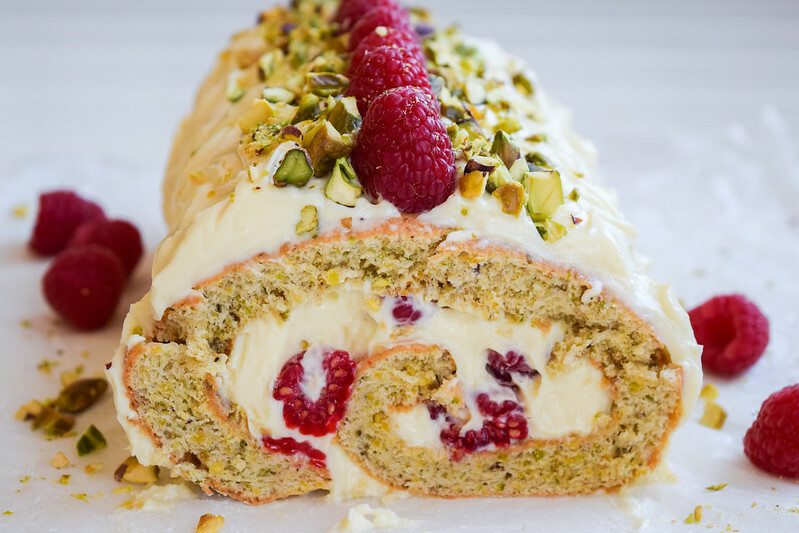 Decorate the top of the roulade with a row of raspberries and some chopped pistachios. If you have the time and space, store in the fridge for half an hour before serving to make it easier to slice. You can keep leftovers in the fridge for up to 3 days, but it is best eaten the day you make it. 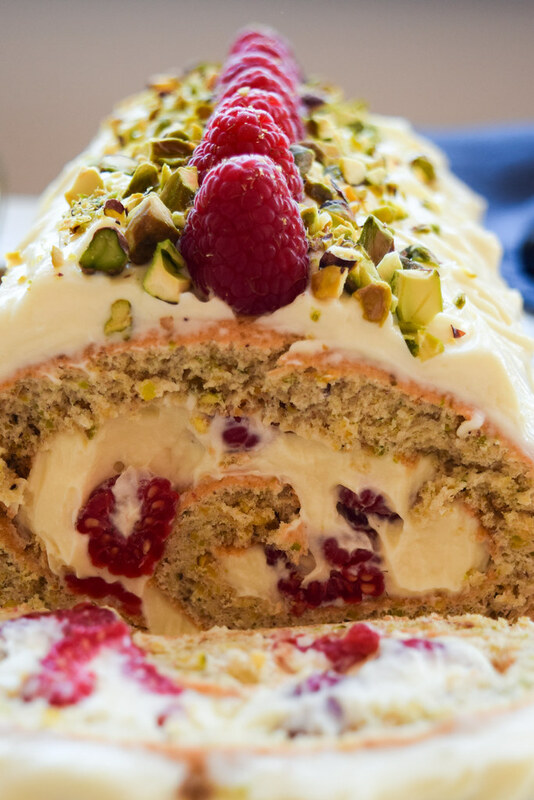 The addition of almond extract does boost the nutty flavour of the pistachios, but if you don’t want to buy a bottle because you don’t think you’ll use it, the roulade is equally as delicious without.